In the winter, there is nothing I love more than a pot of homemade chicken stock simmering away on the stove. After it’s done some might turn into chicken noodle soup, but the rest gets frozen because in the heat of summer you’d have to beg me to turn on the oven to make soup. That’s why gazpacho is a summer staple: cool, fresh, and the prep work is all chopping and no cooking. The benefit of all the hard work in the winter is having homemade stock to use as the base for this recipe. 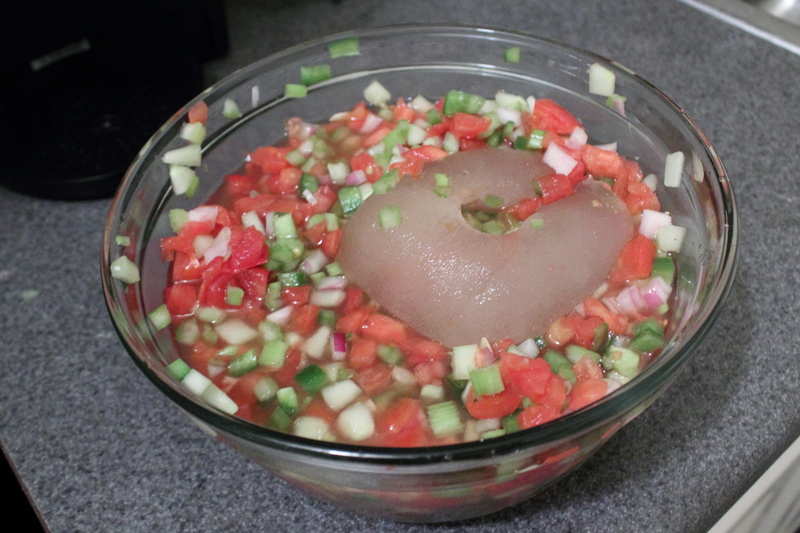 To that, you add diced tomatoes, onion, peppers, cucumbers, celery, and a little sugar and lemon juice. For an extra kick, add a dash of Worcestershire and Tabasco sauces. I left mine chunky, but you could run it through a blender for a smoother consistency. I just added the stock frozen, and let it thaw while all the flavors combined. 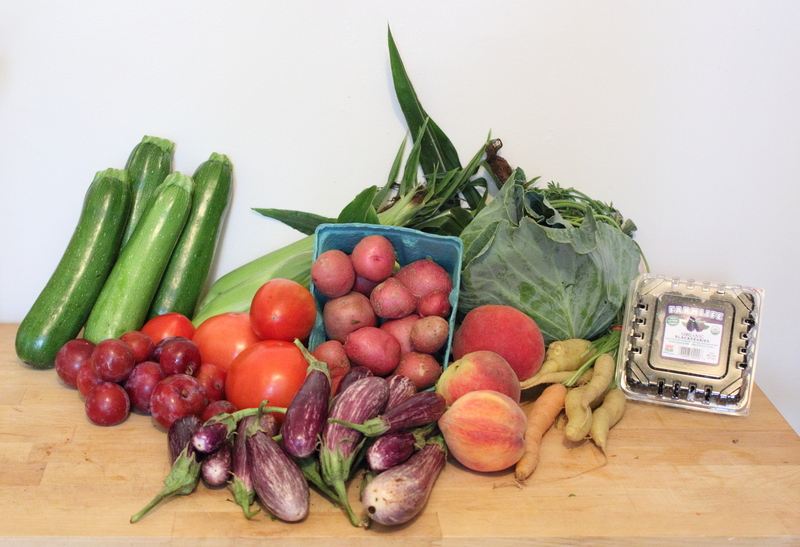 My Grandma is a faithful reader of CSA in the City, and each week when I talk to her, she lets me know which recipes looked good, and which did not. You see, Grandma is not a shrimp fan (she’s allergic, so you can’t blame her). The last few times I made a recipe with shrimp, Grandma made sure to tell me everything I posted that week looked good, except the shrimp. 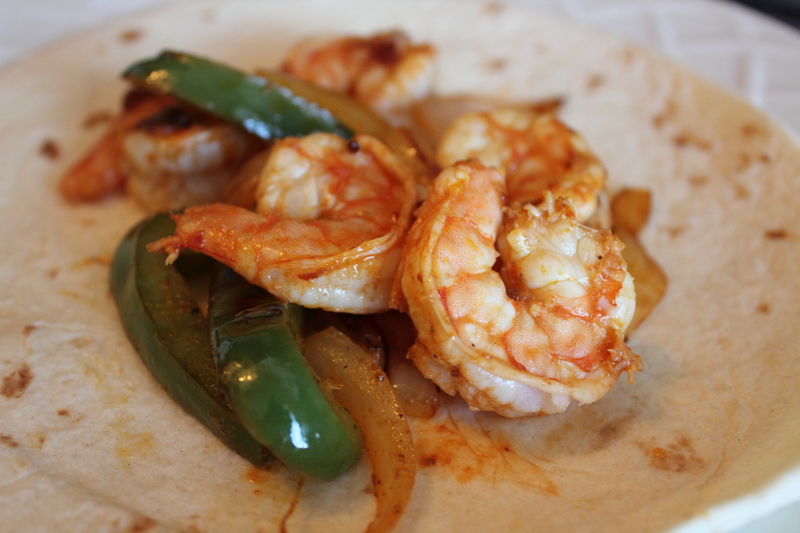 So with apologies to Grandma, here’s another shrimp recipe, this time with a Southwestern flair. The shrimp marinate for a while in a mixture of lime juice, chipotle peppers and adobo sauce (buy one of the small cans at the store) and some garlic and cumin. I don’t have a grill, so I cooked them in a skillet on the stove. 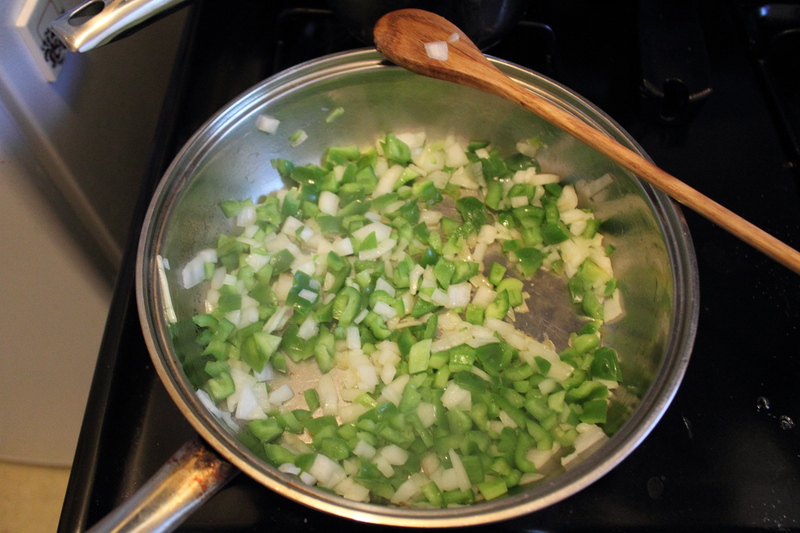 Then, I sliced this week’s red onion with some of last week’s green bell peppers. They got a quick toss in the leftover shrimp marinade and were sautéed until done. Ready for a break from zucchini? I have to admit, even though the recipes make it seem like I’m in zucchini overload this week, the variety of the recipes keep me from getting sick of the squash. That being said, it’s always nice to try something different. I hesitate to call these TexMex stuffed peppers, but that was my “flavor inspiration”, as corny as it sounds. Prefer Mediterranean flavors? Cajun flavors? The base ingredients (peppers, rice ground beef) would go well with a whole range of different seasoning; swap in whatever you prefer! Start by cooking 1 cup of rice. While that is going, cut the top off 4 green bell peppers and remove all the seeds and as much of the membrane as possible, reserving the meaty part of the top (i.e., not the stems). 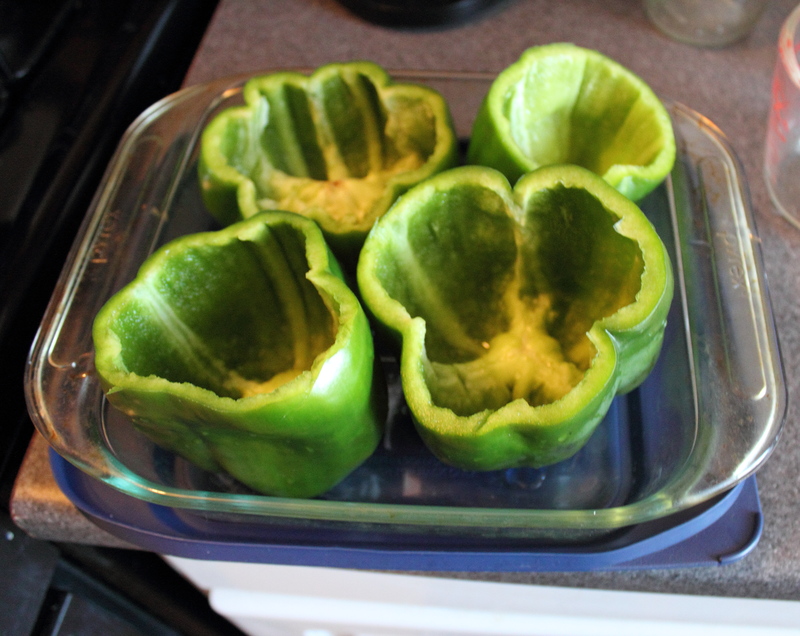 Hollowed out peppers, ready for stuffing! Dice reserved pepper and cook until soft in a skillet with a diced onion. Meanwhile, parboil peppers for a couple of minutes. My pot was small so I had to do one or two at a time. 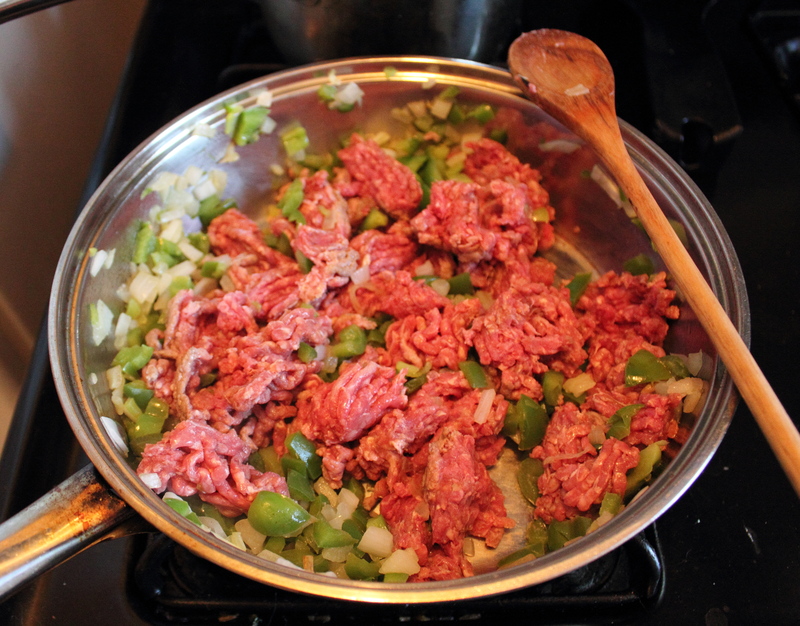 To the ground beef, add 2 tablespoons of your preferred seasoning. I used taco seasoning. Add rice to the ground beef and mix well so rice is distributed in the mixture. Fill peppers with meat and rice mixture and set upright in a baking dish. 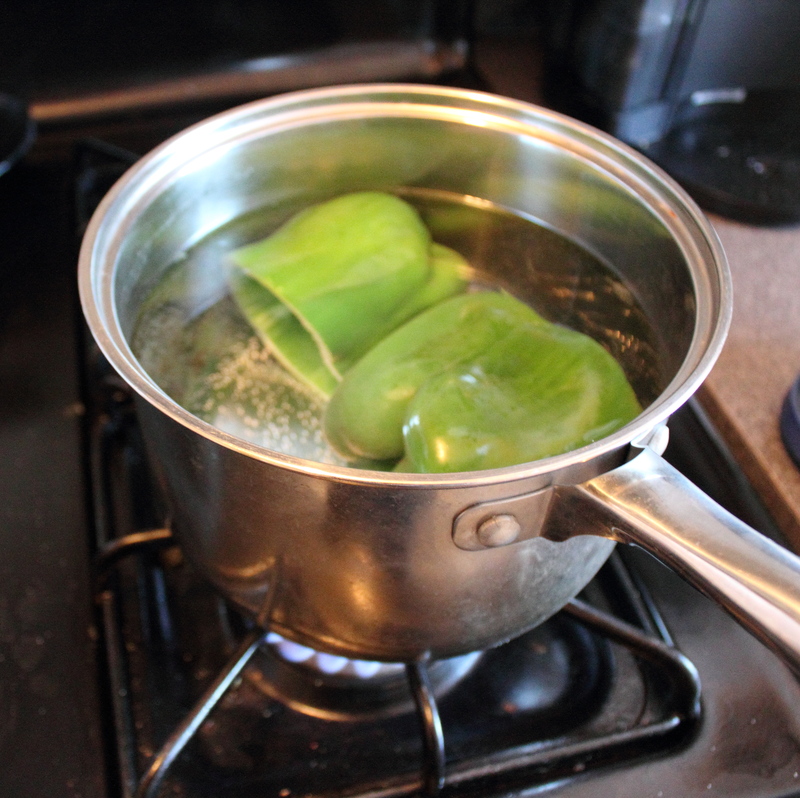 Add water to the dish so it comes about 1 inch up the side of the peppers. Bake at 350 F for 15-20 minutes. Take peppers out of the oven, top with cheese of your choice (I used a shredded Mexican blend), and return to bake 10 more minutes. In a hurry? 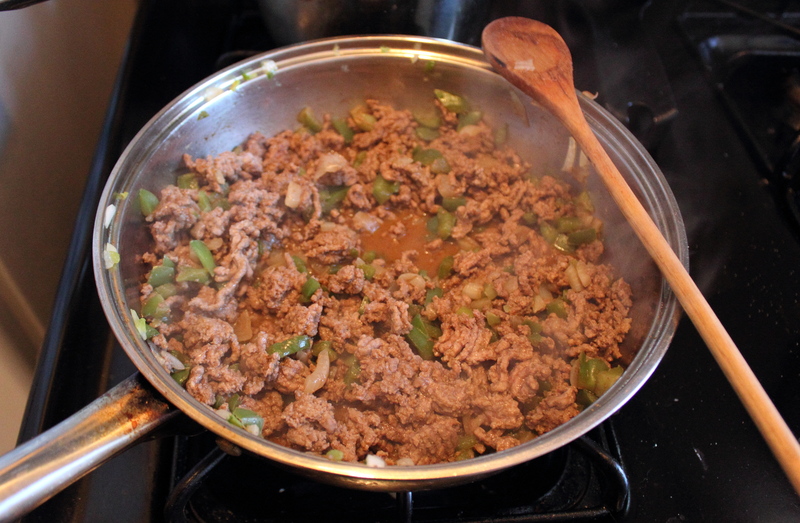 Make the meat mixture ahead of time and bring to room temperature before stuffing the peppers! 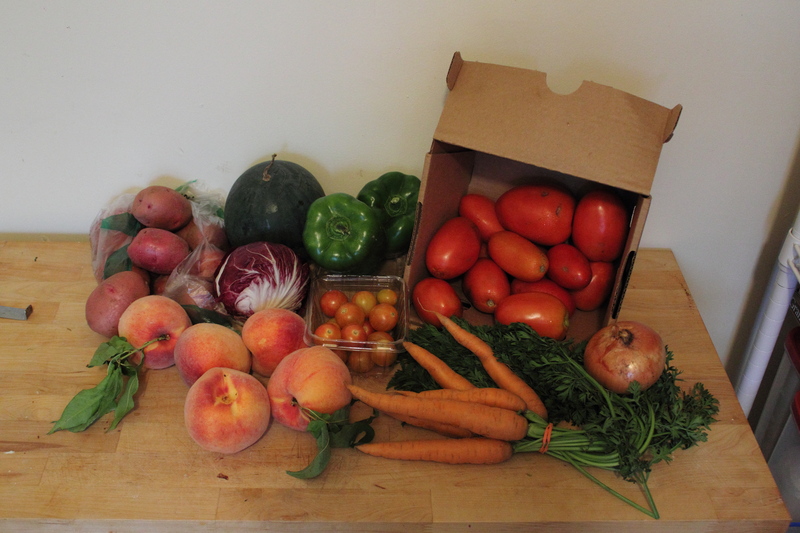 This week’s basket was quite a haul. 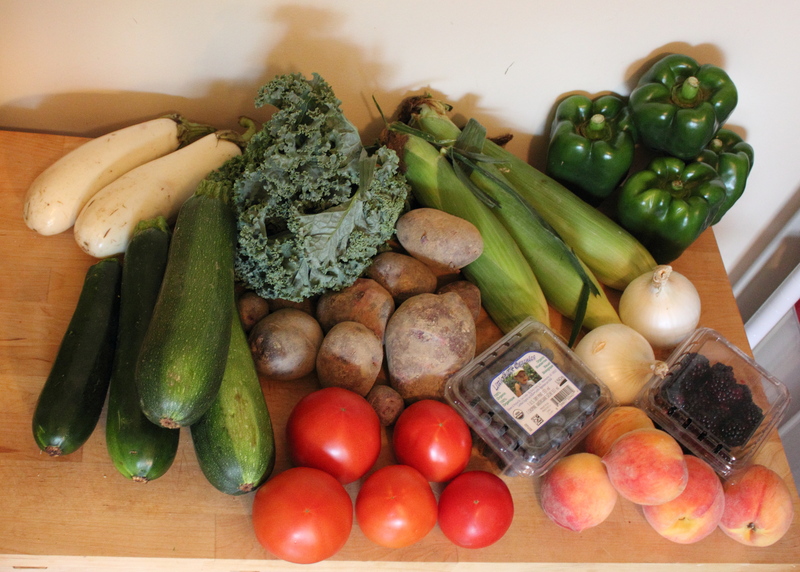 I’ll start posting quantities so you can get a better idea of just how much this is. 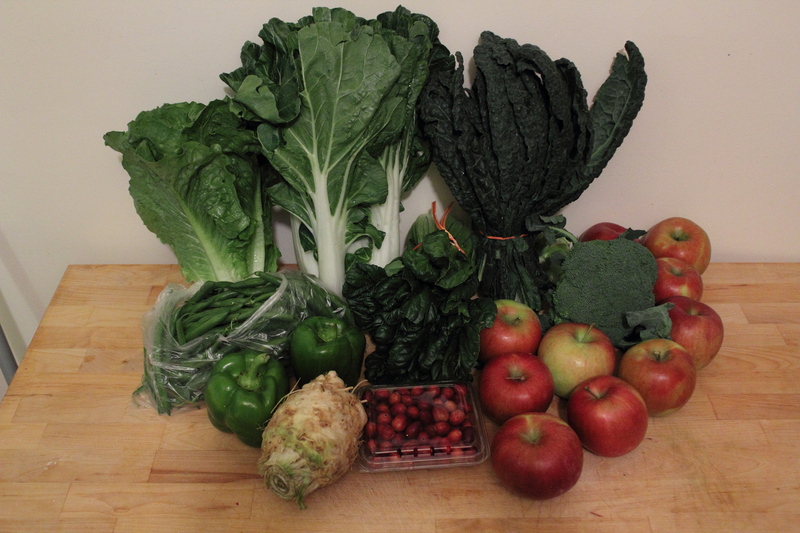 Back row: Blueberry jam (8 oz), blueberries (1 pint), green kale, bulls blood beets, red leaf lettuce, 8-ball zucchini (6). 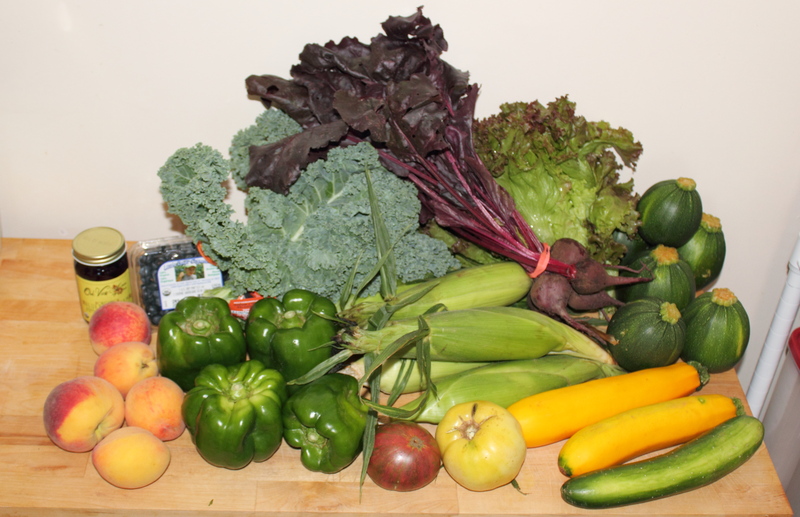 Front row: Peaches (5), green bell peppers (4), heirloom tomatoes (2), bicolor sweet corn (6 ears), gold zucchini (2), and an asian cucumber (although it really looks like a regular cucumber to me, especially when compared to the bumpy, curved one I got last week).